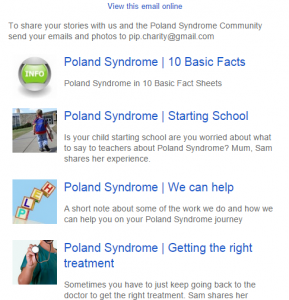 The Poland Syndrome Newsletter is here! We’re trialing this for a while to see how it works out for people. We’d appreciate your feedback on how it works for you. You just need to give us your email address, confirm it’s valid and then you’re good to go. Getting a Poland Syndrome Newsletter up and going is something we’ve been considering for sometime. This will deliver the news straight to your inbox without you having to remember to come to the site. Plus with the Poland Syndrome newsletter you will be able to pick and choose which stories interest you. Which means we can see what things we should be publishing to you and what you’re really interested in.